For the next three weeks, the Louisiana Football Magazine staff is going to recap all Louisiana colleges' National Signing Classes. Today, our recruiting expert Lee Brecheen recaps the 2019 Signing Class for the LSU Tigers! For the next three weeks, the Louisiana Football Magazine staff is going to recap all Louisiana colleges' National Signing Classes. Today, our recruiting expert Lee Brecheen recaps the 2019 Signing Class for the UL Lafayette Ragin' Cajuns! For the next three weeks, the Louisiana Football Magazine staff is going to recap all Louisiana colleges' National Signing Classes. Today, our recruiting expert Lee Brecheen recaps the 2019 Signing Class for the Northwestern State Demons! For the next three weeks, the Louisiana Football Magazine staff is going to recap all Louisiana colleges' National Signing Classes. Today, our recruiting expert Lee Brecheen recaps the 2019 Signing Class for the Grambling State Tigers! For the next three weeks, the Louisiana Football Magazine staff is going to recap all Louisiana colleges' National Signing Classes. Today, our recruiting expert Lee Brecheen recaps the 2019 Signing Class for the Tulane Green Wave! 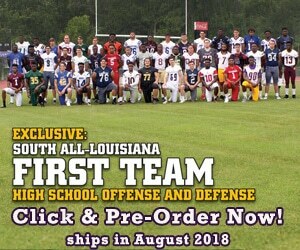 For the next three weeks, the Louisiana Football Magazine staff is going to recap all Louisiana colleges' National Signing Classes. Today, our recruiting expert Lee Brecheen recaps the 2019 Signing Class for the Nicholls State Colonels! LAFM TV 13th Season! Episode 8! November 6, 2018	Comments Off on LAFM TV 13th Season! Episode 8! Hello everyone! We got a great show and trust me, you don't want to miss it. Make sure to check us out in your area by clicking the link! Check out our Week 10 Recruiting Recap featuring Brusly High School, Holy Cross High School, Jeanerette High School, Lafayette Christian Academy, Loyola College Prep, and Madison Prep Academy! Check out today's prep team spotlight on the Richwood Rams as our very own Jace LeJeune goes one on one with Head Coach Robert Arvie to talk about the season and much more! Check out today's prep team spotlight on the Holy Cross Tigers, which is a team that is having a great year under a new, but certainly not fresh face in Guy LeCompte!